Conventional #2 diesel can stay useable at temperatures approaching 0 degrees, which is reasonable for many parts of the United States that may be cold but not "really cold" in the winter. Biodiesel blends, from B5 up to through B100, start gelling at much higher temperatures - some even approaching 50 degrees F. The exact temperature depends on two things - the percentage of biodiesel "FAME" in the blend (higher percentages gel at higher temperatures) and the base fat that the biodiesel was made from - fats like palm oil gel at much higher temperatures than fat like canola or rapeseed oil. BIO COLD FLOW IMPROVER solves these problems for most types of biodiesel, with multiple cold flow improvers that keep both the biodiesel FAME and regular diesel base portion of the blends useable and flowing at lower temperatures than untreated biodiesel fuel. Use of BIO COLD FLOW IMPROVER takes cold filter plug point temperatures up to an extra 15 degrees, and lowers pour point (the temperature at which the fuel remains pourable) up to an extra 30 degrees. BIO COLD FLOW IMPROVER also eliminates water and moisture in the biodiesel fuel - a primary cause of accelerated fuel quality degradation. 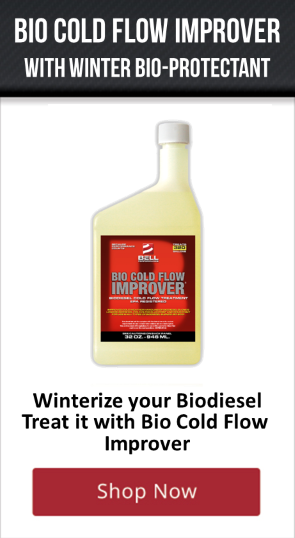 BIO COLD FLOW IMPROVER protects most biodiesel blends in cold weather at a treat rate of 1 oz. to 12 gallons (1:1500). As always, it is recommended that the biodiesel fuels you use be certified through meeting the ASTM D-6751 specification for biodiesel.